Creating a scatterplot in SPSS is pretty straightforward. However, I sometimes like to take a quick look at all scatterplots among a set of variables. So I created a simple tool that creates all of them in one click. First off, make sure you have SPSS version 18 or higher with the SPSS Python Essentials properly installed and tested as the tool won't run without them. 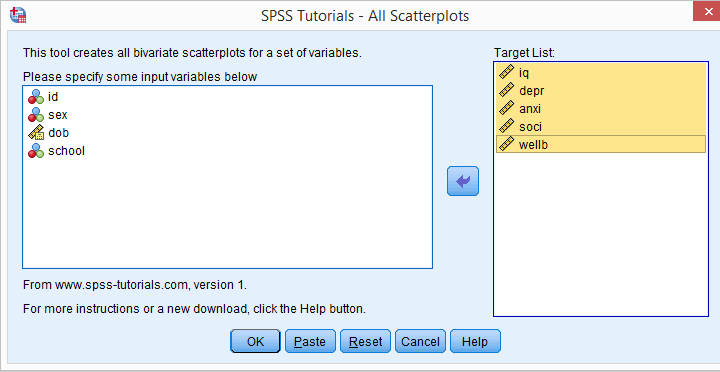 Next, download the SPSS All Scatterplots Tool. For SPSS versions 24 and higher, navigate to Extensions Install local extension bundle as shown below. Earlier SPSS versions have something similar under the Utilities menu. Close off and restart SPSS if you're on version 23 or below. All Scatterplots Tool - How to Use? If you successfully installed the tool, you'll find it in the Utilities menu. Just select one or many variables, click Paste and run the syntax. Let's try that on adolescents.sav, a data file mainly holding psychological test scores on adolescents. Part of its variable view is shown below. I'll select the last 5 variables. Clicking Paste results in the syntax below. Let's run it. 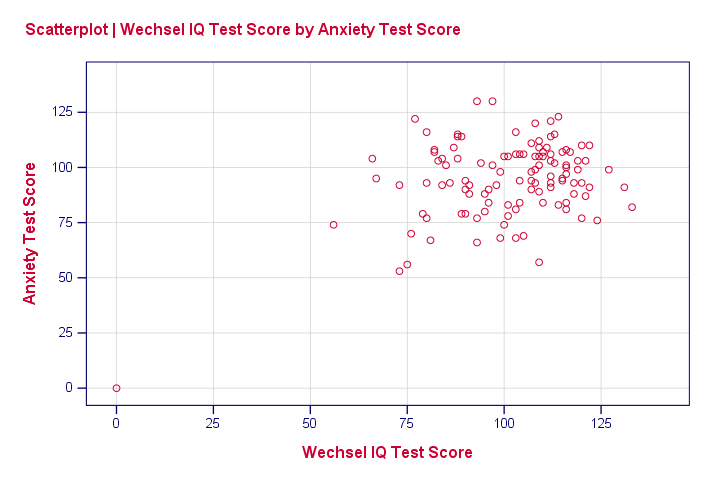 *Create all bivariate scatterplots between iq depr anxi soci and wellb. SPSS_TUTORIALS_ALL_SCATTERPLOTS VARIABLES = 'iq depr anxi soci wellb'. SPSS_TUTORIALS_ALL_SCATTERPLOTS VARIABLES = 'iq to wellb'. Note: you can shorten the variable specification somewhat by using TO or even ALL as shown in the second example. Sure enough, running the syntax results in all 10 distinct scatterplots: for 5 variables, there's 5 * (5 -1) * 0.5 = 10 unique variable pairs. One of those is shown below. Bonus question: does this scatterplot show anything problematic? You obviously can't select any string variables in the tool’s dialog. If you add names of string variables to the syntax manually, the tool will silently ignore them. For prettier charts, set some chart template before running the syntax. That's it. I hope you'll like this little tool as much as I do. In the same spirit as this extension, I would like to point out the STATS REGRESS PLOT (Graphs > Regression ariable Plots) extension that is installed with the Python Essentials or can be installed from the Utilities or Extensions menu. This was designed to help in screening candidate regressors, including nonlinear transformations, in a regression model. It plots one variable against each of a set of variables in a compact format. The type of plot chosen is based on each variable's measurement level, and there are a number of choices as well as fit line options.